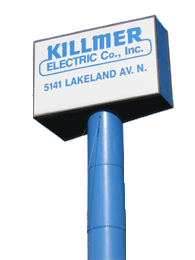 Killmer Electric Co., Inc. was established in 1920 and, by the mid-1940’s evolved into a commercial construction and maintenance contractor. Purchased by the Palmer family in 1975, Killmer was expanded to include highway/heavy, industrial, utility and energy construction with a strong emphasis on airport and airfield electrical construction. We maintain a large and efficient staff of electricians, linemen, operators and groundmen able to achieve any task before them. Our management team is specialized to areas of expertise, but diverse enough to assist in any field of work. Our service divisions pride itself on quick response to all customer’s needs and maintaining long-standing relationships. Every employee and member of Killmer Electric is committed to the same goals; Quality, Safety, Customer Relations and Repeat Business. Today, Killmer Electric is one of the preferred contractors by the Metropolitan Airports Commission and a leader in MnDOT and municipality work. Killmer Electric credits our past and current success, growth and relationships on our staff, who are the cornerstone of the company. Our field and supervisory personnel’s knowledge, experience and commitment to the industry have built solid relationships and insured successful project completions with the highest level of quality and safety. © 2019 Killmer Electric Co, Inc. Powered by RunSpot Inc.